When choosing a point of sale printer (POS) which is used by most businesses, a thermal printer is considered and Epson Thermal Pos Printers are the top choices in this regard. These printing devices are capable of volume printing and they do this in the quietest way. Basically, Epson Thermal POS Printers offer the same advantages that every business wants to accomplish like reliable, fast speed and high quality prints. However, each has its own feature that makes it different from the other. Epson TM T88IV Two-color (monochrome) Thermal Line Printer is compact in its size of 5.7” W x 7.7” D x 5.8" H and weight of 4 lbs. It comes with either a cool white or dark gray design that is spill-resistant. It is created for high volume printing that is a requirement of most retail businesses and hospital related industries. This printer is user-friendly with its durable automatic paper cutter, drop-in loading, Auto Status Back messages and Maintenance Memory. It is reliable with its fast speed of 7.9”/sec for both mono and color and is capable of two-color printing on receipts that consist of logos and high resolution graphics. It has USB interface and wireless connectivity. Epson TM T88V B/W Thermal line printer measures 5.7” x 7.7 “x 5.8 “and weighs 3.5 lbs. It delivers more speed, at a rate of 708.7”/sec for both text and graphics. It has a print resolution of 180 x 180 dpi that provides optimum performance. It comes with the ease of use, an easy drop-in loading and status LEDs. It, also, comes in a design that protects it foreign objects. It is compatible with Windows and Mac operating systems and has dual interfaces. It is Energy Star qualified with its minimum paper and power consumption. 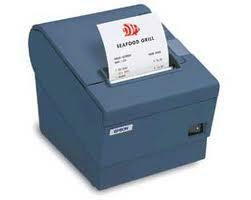 With this printer, receipts, vouchers and rebate promotions are printed professionally with sharp text. It comes with an automatic speed adjustment feature that prevents streaking. By means of diverse tools, you consume less in the designs of receipts. These are the intelligent logo preprint, which makes you print adjacent to the edge, and the automatic receipt reduction. This scales the contents without changing the sizes of fonts. Epson TM-H6000II-721 – Printer is a high performance multifunctional device that comes with many features. It is capable of two-color receipts. It has an exclusive QuickPass™ for a quick processing of checks. It produces high resolution graphics with no, whatsoever, delay in processing. It is convenient to use with its drop-in paper loading and advanced slip handling with built-in forms stopper. It has a size of 7.3” W x 11.7” D x 8.2" H. It comes in colors cool white or dark gray, which is typical of Epson printers. Epson TM-L90 Label/ Barcode Printer is ideal for those who want an affordable device that is capable of multiple printing. With it, you can come up with high quality receipts, labels and tickets with its resolution of 203 x 203 dpi and with a fast speed of 5.9”/sec. It measures 5.5″ W x 5.8″ D x 8.0″ H and weighs 4.18 lbs. This printer comes with the ease of use with its drop-in paper loading and label peeler which, automatically, removes labels from the liner. You can make your own designs of products and labels with the cut and paste software. Epson TM-L90 Label/ Barcode Printer has various applications making it suitable for labeling of photos,food, pharmacy and verification of retail prices. Epson TM T88IV Two-color (monochrome), Epson TM T88V B/W, Epson TM-H6000II-721 and Epson TM-L90 Label and Barcode Printer are the devices featured in Epson Thermal POS Printers that are advantageous to businesses with their high performance in speed and quality of printouts. They are easy to use with their drop-in loading feature. They, also, come with technologies that are exclusive to Epson, which make printing more reliable.